In this "new woman" novel, the tomboyish heroine has inherited money but, much to her friends bewilderment, chooses to work as a landscape gardener. Initially rejecting her suitor, she finally capitulates, but warns, "I must live my own life!" Frances Mary Peard. 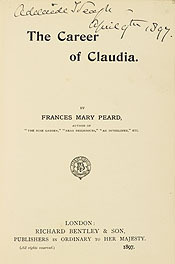 The Career of Claudia. London: Richard Bentley, 1897.